As the summer months beckon Canadians to the far reaches of their expansive country, the incumbents boast of unbeatable coverage and higher speeds in more places. As each carrier announces multi-million dollar investments in specific parts of the country — TELUS in Ontario, Rogers in British Columbia — it would be easy to dismiss the remaining national new entrants, particularly Wind and Mobilicity, as too little, too late. But while Mobilicity teeters on the brink of bankruptcy, Wind continues to shine in its limited capacity, netting higher postpaid subscribers than Rogers this past quarter. It posted record revenue in April and May, and promises to continue that momentum on the back of its extremely successful Unlimited USA plan, which combines Canadian and American talk, text and data into a single monthly fee. Tony Lacavera, Wind Canada’s Chairman, sees a positive outcome from this tenuous period. The government’s recent decision to regulate domestic roaming will make it cheaper for Wind, and ultimately its customers, to travel outside of the company’s Home network, and there’s already evidence that such a move will improve Wind’s prospects in the market. To wit, four months after Wind introduced its Unlimited USA plan there are now 30,000 customers taking advantage of it, and roaming data traffic has increased by 100 times. At home, Wind customers are using 1.5GB of data per month, up 600MB from a year ago, and over 90% of all devices sold from its 300 stores are smartphones, 85% of which run Android. And though the company continues to fall behind the incumbents by not offering LTE connectivity, 360 of its 1408 cell sites are already Dual-Carrier HSPA+ enabled, capable of pulling speeds of 42Mbps in the downlink, with more to come. “The reality is that the business of Wind is doing far better than has been reported by both the media and analysts. 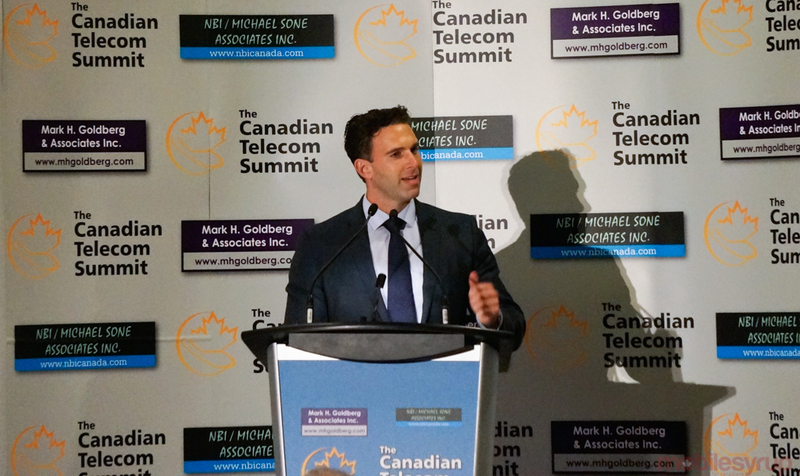 We’re here to stay,” said Lacavera during an interview at the Canadian Telecom Summit this week. “But we still have ownership challenges,” referring to the ambiguous state of foreign investor Vimpelcom’s attempt to buy a controlling stake in Wind Canada, which was blocked last year by the government. Wind exists in what Lacavera calls “a nebulous state,” where investors are weary to strike deals with a company they are unsure will be allowed by the government. Just last year the government, which has reiterated it wants a fourth national wireless carrier in every Canadian region, blocked the sale of Allstream, a division of MTS, to former Wind Mobile owner Naguib Sawiris, on security-related grounds. Though Wind is struggling to raise funds for larger investments, and could not obtain the necessary capital to invest in the recent 700Mhz spectrum auction, Lacavera is confident about the company’s future. “We are a stable business with good distribution,” he said. Not only is the company perceived as having a much stronger national network since the rollout of Unlimited USA, but it is filling in coverage gaps in large Canadian cities its towers previously could not reach. Lacavera acknowledges that Wind needs LTE coverage to stay competitive in the future, but maintains that DC-HSPA+ provides sufficient speeds for most users most of the time. He also says that Wind’s ability to acquire high-end Android flagships like the Samsung Galaxy S5, LG G2 and HTC One M8 on the same day as the incumbents has done wonders for the company’s positive perception in the markets it serves. Unfortunately, Wind still only covers 14.2 million customers, and will eventually reach 15 million by mid-2015. Without additional spectrum, not only can’t Wind roll out LTE but it can’t fill in the coverage gaps made easier by low-band 700 or 850Mhz frequencies. While upcoming spectrum auctions, including 2500Mhz early next year and, later, 600Mhz and AWS-3, could be potential acquisition targets, Lacavera says the only way to quickly and cost-effectively roll out LTE is to partner with another new entrant like Mobilicity, Videotron or Shaw, all of which are sitting on AWS spectrum. Lacavera notes that the government has made significant improvements in the plight of the new entrant since Wind launched in 2009, but “ridiculous roaming costs, a failed tower-sharing regime, and fragmented spectrum across new entrants, such that no one new entrant…had sufficient spectrum, combined with unfettered anti-competitive behaviour from incumbents,” fashioned the unfortunate outcome we see today. But Wind is still running a business. It has 25,000 iPhone 5s devices across its 735,000 subscribers, while Samsung comprises 30% of its smartphone sales and 50% of its revenue. The company’s postpaid churn has declined to “Big Three levels” at 1.3%, and postpaid ARPU (average revenue per customer) stands at $38, slowly eating away at the delta with Rogers, Bell and Telus. While it won’t make any money in 2014, increasing customer run-rate and lower capital expenditures will likely lead to a profit by mid-2015. Later this year, likely by the end of the summer, Wind will roll an unlimited Canadian roaming option, and plans to offer LTE roaming in the United States by the end of the year. Though it will continue to be dismissed by the incumbents as a small fish in a big national pond, Wind is clearly weathering the fight better than Mobilicity, which is currently in creditor protection and may face bankruptcy in the coming weeks. Whether Wind partners with Videotron, finds a way to purchase Mobilicity or continues to go it alone, Lacavera continues to be a confident outlier, a tentative supporter of the current government’s plans and the head of the only company offering a substantially cheaper option for wireless data in places like Ontario, British Columbia and Alberta.